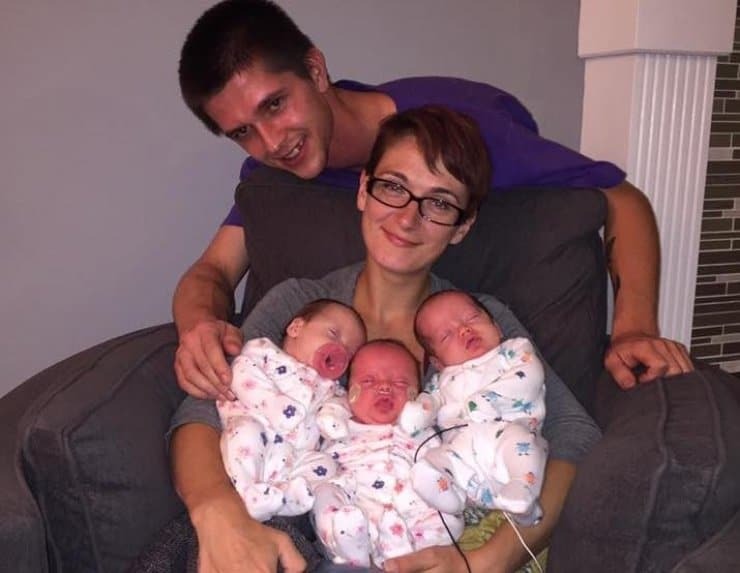 ROLLA – Janey and Dustin with their three newborn babies in September, 2017. Photo by Pregnancy Help News. ROLLA – When she first learned she was pregnant, Janey was at a loss for what to do. Homeless and sleeping on someone else’s couch with her 4-year-old daughter, having another child seemed to be not only an inconvenience, but a near impossibility. Little did she know things were about to get even more complicated—and far more beautiful. After a quick internet search, Janey found Pregnancy Resource Center of Rolla – an organization supported by Ft. Wyman Baptist Church, a Missouri Baptist congregation in Rolla. During her first appointment, she confirmed her pregnancy and had a long coaching session, discussing in detail the three options before her. She agreed to come back for another session and set an appointment for an ultrasound. “The most empowering thing that we can do for women in this situation is our options coaching because coaching is really different from counseling,” explained Jane Dalton, the center’s client services director and program director for St. Raymond’s Society, a transitional home for women facing unexpected pregnancies. Janey wanted to choose life for her baby, but before she could return to the center for her ultrasound appointment, she ended up in the emergency room with what appeared to be a dangerous complication to her pregnancy. That’s where Janey learned via ultrasound she was pregnant with not one, but three babies. Dalton immediately offered Janey housing through St. Raymond’s Society, where she could also focus on planning for her and her children’s future. The triplets were born by C-section on June 30, 2017, at just 28 weeks gestation. Identical twin girls Taytum Raye and Arabella Skye each weighed two pounds, three ounces, and their brother, Xander Blayne, weighed two pounds, eight ounces. On Sept. 15, after over two months in the neonatal intensive care unit, Xander was able to head home to St. Raymond’s. Five days later, on September 20, Arabella was released from the NICU. Taytum was then reunited with her siblings and mother Sept. 27. The transitional home was ready with three cribs for the new family members, a toddler bed for big sister, and a bed for Mom. While Janey transitions into life as a mother of four, the triplets’ father, Dustin, has also stepped up to play a key role in his family’s life. He was present at the babies’ birth and is looking to the Daltons and others for help with parenting skills as he embraces fatherhood. Girls and women who come through St. Raymond’s get their GEDs, go to college, earn professional certificates for medical careers, and graduate ready to work. All the while, they are learning to parent their children—something many residents worried would never be possible. Janey is beginning online classes and participating in a program the Daltons created—appropriately titled “My Ridiculously Amazing Life”—while meeting regularly with a success coach whose focus is on helping Janey develop self-sufficiency in healthy relationships, education, housing, transportation, budget and finance, household skills and parenting skills. By the time the triplets are school age, the goal is for Janey to have graduated and enter the work force. “Her life has changed drastically from having triplets but it’s also changed drastically from having this support,” Jane Dalton said. With all three babies home at St. Raymond’s, her now 5-year-old in kindergarten, and beginning her own college education, Janey has a plenty on her plate. She also has plenty of support from Dustin, the Daltons, and a team of volunteers who have come alongside her in the past year.